50044 heading towards Leamington Spa D444 is seen coasting towards Leamington Spa at Whitnash on the 9th May 2009 whilst working a Network Rail/Spitfire organised charter from Bristol to Aberystwyth "The Cambrian Mountaineer". The tour was worked forward from Shrewsbury by 37676 and 97301. Exeter is owned by the Fifty Fund and runs as part of the Class 50 Alliance, and when captured here wore an unauthentic two tone green livery similar to that carried by the Class 47s when first introduced. 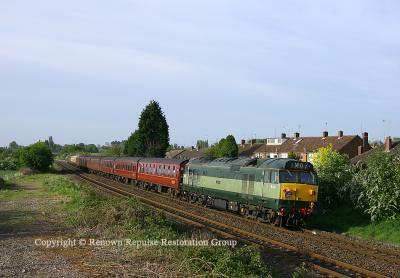 D444 is seen coasting towards Leamington Spa at Whitnash on the 9th May 2009 whilst working a Network Rail/Spitfire organised charter from Bristol to Aberystwyth "The Cambrian Mountaineer". The tour was worked forward from Shrewsbury by 37676 and 97301. Exeter is owned by the Fifty Fund and runs as part of the Class 50 Alliance, and when captured here wore an unauthentic two tone green livery similar to that carried by the Class 47s when first introduced.